It wasn’t quite the new normal, not yet. Nike HQ people were still in town as their final stop before returning to Oregon, but for Beverly, the trip was finally complete. But there were team meetings and dinners, and for Bev & I the settling in – going to IKEA, picking out a car that we’re going to lease1thanks, Phil., stuff like that. Friday night was the last night in town for the Portland-bound folks, so Beverly and I met two of her former officemates for dinner and a night out. We met Mona at the Mandarin Orchard – the sister hotel to the place that hosted us on our house hunting trip. Meeting Mona in the lobby, we decided to walk to the MRT station a block away and take the train to our destination for the night, Clarke Quay, a popular nightlife area2and somewhat of a tourist trap.. It wasn’t quite the new normal for myself, either, as my aunts Lindsey and Jane and my uncle Rollin were in town as part of a SE Asia vacation they had been planning for months. Wednesday night, we had met them in Holland where they got to sample a Wednesday night taste of Holland’s night life. The following evening, I met them at their hotel, the Jen at Orchardgateway, which boasted an amazing rooftop pool with a view of almost the whole city. I figured Bev & Mona would like to see the view as well, and since the hotel was literally right above the Sommerset MRT stop, we rode up the lift to take it in. Singapore’s subway system is quite the comfort. Air conditioned (of course) and clean, it’s a smooth way to get around a majority of the island. The only complaint I have is that our local stop, Holland Village, is on the so called “Circle Line” which makes a circle around downtown, connecting all the outside areas and lines. However, it’s not a complete circle, so going downtown involves a lot of train changing. Still, it’s a minor complaint as all the stations are air conditioned and everything is well marked. We made a change Friday night as well, down the red line one stop to Dhoby Ghaut, the main interchange for the whole system. 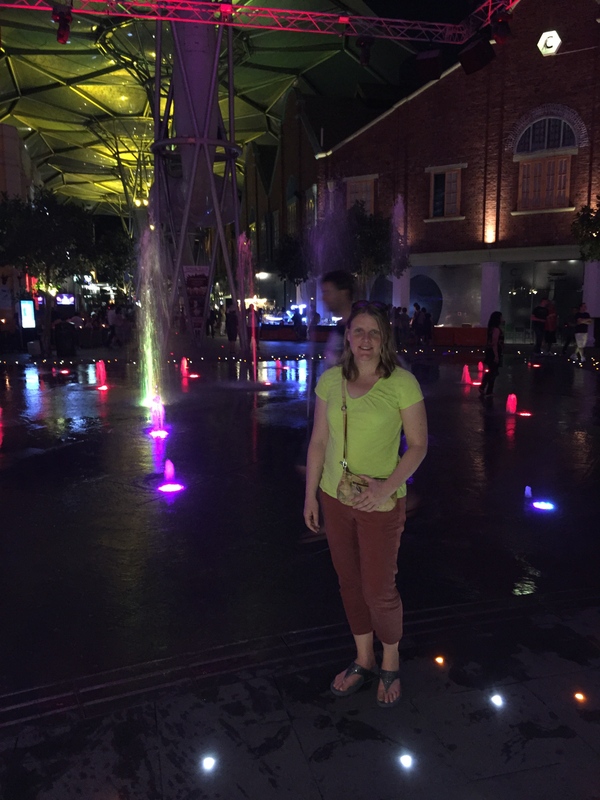 From there, we took the purple line to Clarke Quay where the Singapore River awaited us. The Singapore River isn’t much of a river. It’s a decently wide waterway for something in the middle of a major city, but a canal would be a better word to describe the river. Either way, low bridges cross the river for foot and car traffic, and Clarke Quay crowds the banks with river cruises, riverboat dining, and a whole host of bars and restaurants. We walked for a bit, but due to Bev’s insistence that I wear full-length pants3“We might be going somewhere nice”, I felt the need to sit and relax a bit. We found a pub in the center of Clarke Quay, right next to a huge fountain that the ladies would later walk through4they were all wearing shorts, grumble. where we waited for Jeff, our fourth for the night. 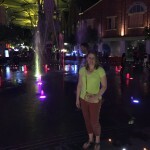 Beverly takes a step into the fountain at Clarke Quay. Clarke Quay is beyond a doubt sort of a tourist trap, but it’s a fun place to get a drink and have a good meal. After searching for a Moroccan place that we saw listed, we conceded that it was probably shut for good and decided instead on a Thai place right on the river. Wait service in Singapore isn’t always the best, but this place was particularly slow and cumbersome – the staff seemed a bit confused and overworked, despite there being a host of black-shirted folks just standing around near the host’s podium. Regardless, the food was good – this is Singapore after all – we enjoyed some incredibly spicy Tom Yum Gai, a full deep fried fish, curry and a seafood & rice dish. The final bill I’m sure was overpriced, but that’s what you get in Clarke Quay. “Higher Power” gets its groove on. It was 8:30 when we finished dinner, and not ready to go back to our hotels/apartment just yet, Jeff set out on finding us some local music. We finally found a band starting at 9, and being a few minutes sort, we ducked into “The Highlander”, a Scottish-themed pub with truly obscene prices on scotch whiskey. With a few lagers in hand, we sat through the first set of a cover band called “Higher Power”, whose three singers all had great voices, but their song selection left a little to be desired to start the show. 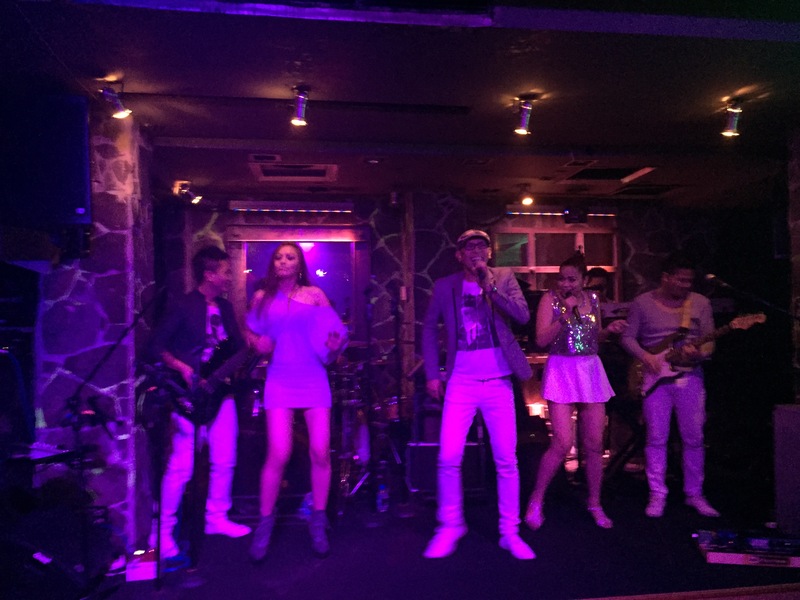 They started with “No Woman, No Cry”, which was done incredibly well, the male lead’s voice doing a fine rendition of Bob Marley’s Jamaican accent, but they followed with four over-the-top love ballads (including a passable, but never fully doable, version of “I Will Always Love You”). Once the slow stuff got out of the way, the rest of the night became a lot more enjoyable, even with covers of the tired “Happy”. The bass player even got to show his stuff a bit with some funk – something I always appreciate. Around 10:30, we called it a night, and Bev and I took a cab back to our home, the feeling of that sentiment growing with every day.